Mixing styles of decor in your home keeps it looking fresh and interesting. Take a look at how I’ve combined a rustic chandelier with modern farmhouse style in my dining room. We’ve been working on our new-to-us beach condo for weeks and I’m super excited to start sharing the changes that we’ve made with you! First up is the dining area. 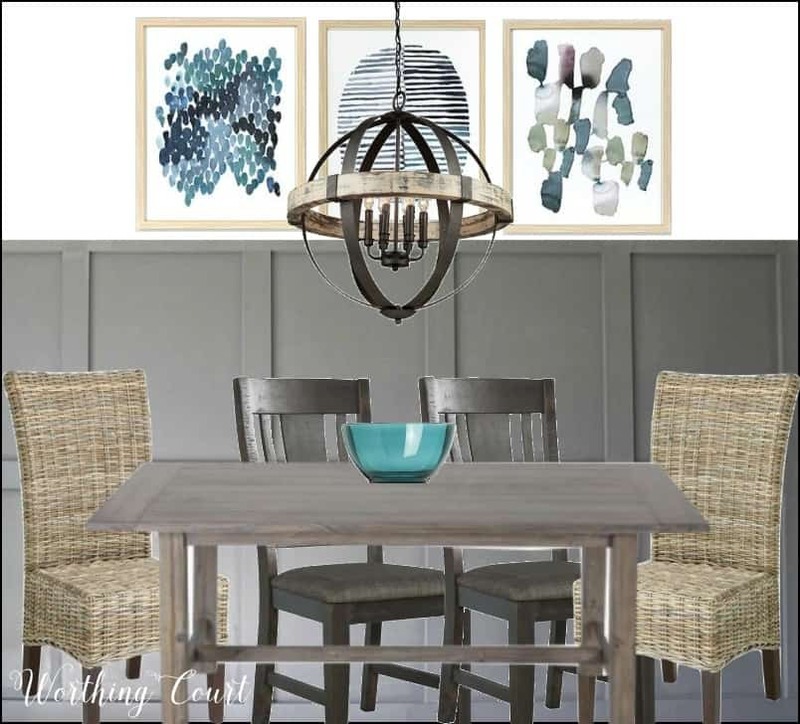 I want to show you how this GORGEOUS rustic chandelier from Lighting Connection inspired the entire new look for the dining room area. 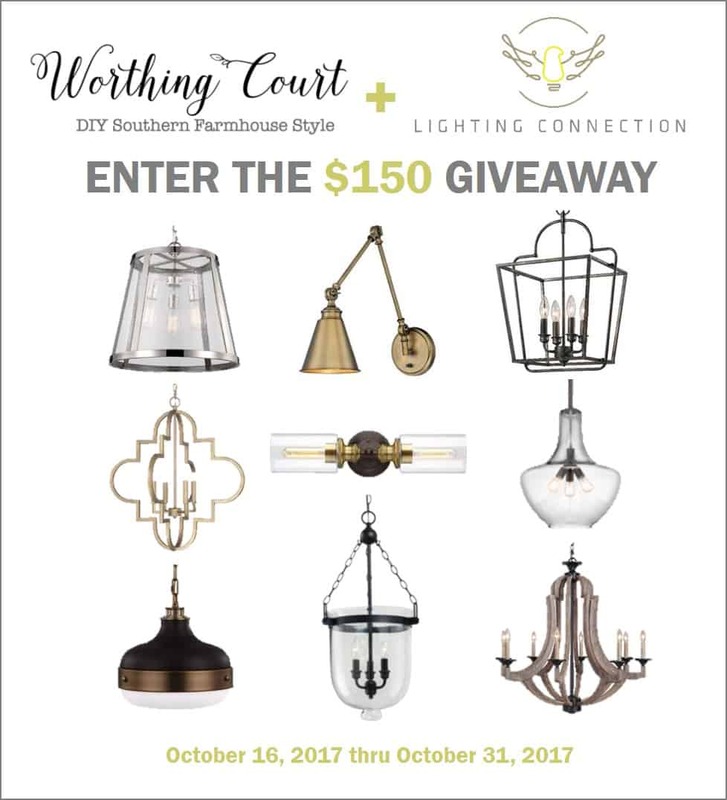 Annnd…there’s an amazing giveaway from Lighting Connection at the bottom, so be sure to read to the end. You don’t want to miss it! DISCLOSURE: I was compensated for this post by Lighting Connection. All opinions are mine alone. Let’s start at the beginning. Here’s a BEFORE of the dining room area that I’m working with in our condo. As you can see, it’s a small area that opens to kitchen and the front entry area. What you can’t see in this photo is that it is also open to the family room. My goal was to get rid of the beach-look overload and replace it with modern farmhouse style with just a bit of a beach vibe. I want give a nod to the fact that you’re ocean front, but I don’t want that look to be in your face. When I’m designing a space, I need an inspiration piece. I may have an idea of the general look that I’m going after, but it really helps to find something specific to inspire me. I started out on Pinterest (you can follow me HERE), but I couldn’t find the exact combination of styles and colors that got my design juices flowing. Know what I mean? When I wasn’t successful finding the inspiration that I needed on Pinterest, I turned to looking at light fixtures. 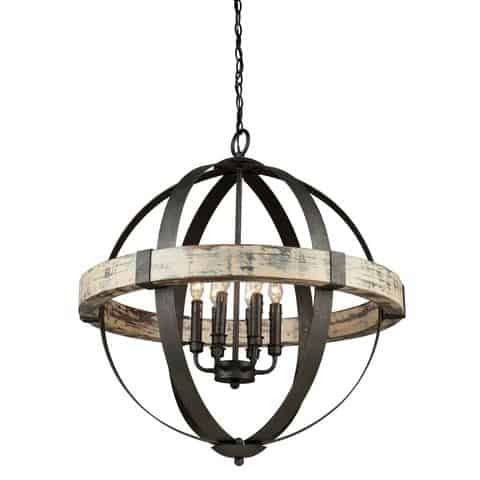 I knew that I wanted to get rid of the ceiling fan and replace it with a fabulous statement making rustic chandelier. I found exactly what I was after at Lighting Connection when I came across their Costello Orb Chandelier and then the rest of my design plans fell into place. And here’s what this beautiful rustic chandelier looks like in place. Love, love, love! Yes, it’s large (it’s the 26″, 6 light version) – in fact you may think that it’s too large for the space. But, because of the way the kitchen, front entry and family room are all open to one another, I felt like a smaller fixture would get lost in the space. I admit that I was pretty nervous, but now that it’s in place, I’m really happy that I listened to my instincts and went with the larger version. 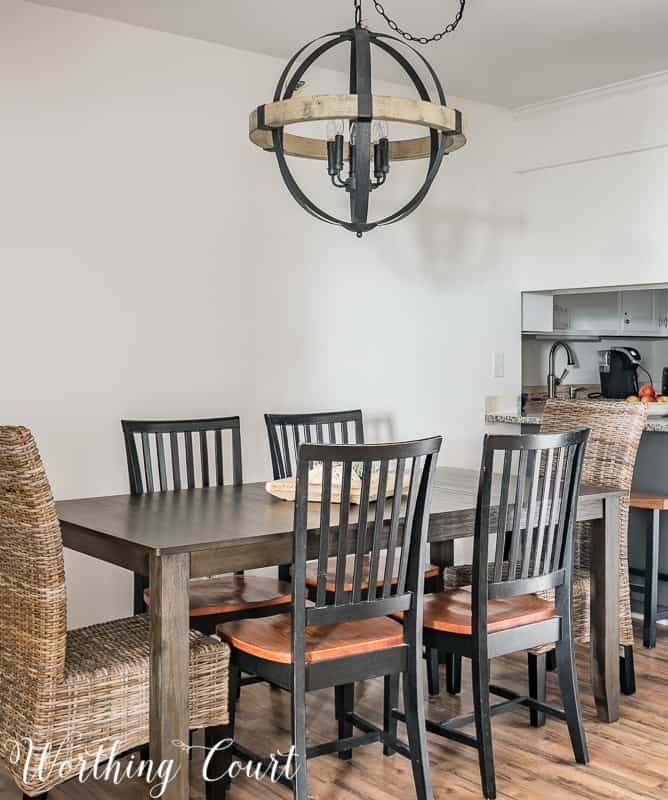 And yes, the chandelier is hanging a bit higher than I’d normally hang a fixture above a table, but this rustic beauty is meant to serve as a light fixture for the entire space, not just for table lighting. We’ve come a long way in the space already, but we’re finally finished with the major projects and are down to the fun decorating part. 😀 Here’s a breakdown of our to-do list for this part of the condo. I’ll be sharing all of the resources as we complete the room. For now, I’m happy to report that this area is coming along exactly as I envisioned when I created this mood board to help keep me on point. Psst! Love the idea of using a mood board for your own home decorating? Learn how easy it is to create one by clicking HERE! Connect with Lighting Connection for even more inspiration! Follow on Facebook HERE. Follow on Pinterest HERE. Follow on Instagram HERE. Lighting Connection has an amazing selection of modern, up to date lighting at really great prices. Enter for your chance to win a $150 e-gift card! The contest will end on Tuesday, Oct. 31st at 11:59pm EST and the winner will be notified by email. No purchase is necessary. As always, your post INSPIRE me! Love your lighting choice! Can’t wait to see more!! Oh I love this> I tried to talk my nice into something similar for her beach condo! Suzy, that light IS a statement piece. Love it, and what a great change from the ceiling fan. Can’t wait to see more of your beach decor. Thank you for the opportunity to win.. So excited for the beach condo. Just a suggestion🤔 if you want to. the DR and Kitchen area. Not much loss in soffit or cabinet space but wil make a huge difference. I have just started some changes in our home – my walls, draperies, and sofa are all neutral – a creamy color – so a complete change is very easy. I left all the neutral items in place – but I started my redo of the entire house by using an inspiration piece. It is a beautiful wool area rug with a number of colors – every room will have a touch of one color or other – and I am painting a hutch in a color selected from the rug. I have a large sample piece that I can take with me when I shop. That rug is making my update easy and fun. It took awhile to pick the inspiration rug but when I saw it I just knew. Your article is inspiring. You are the Barefoot Contessa (Ina Garten) of home decor. 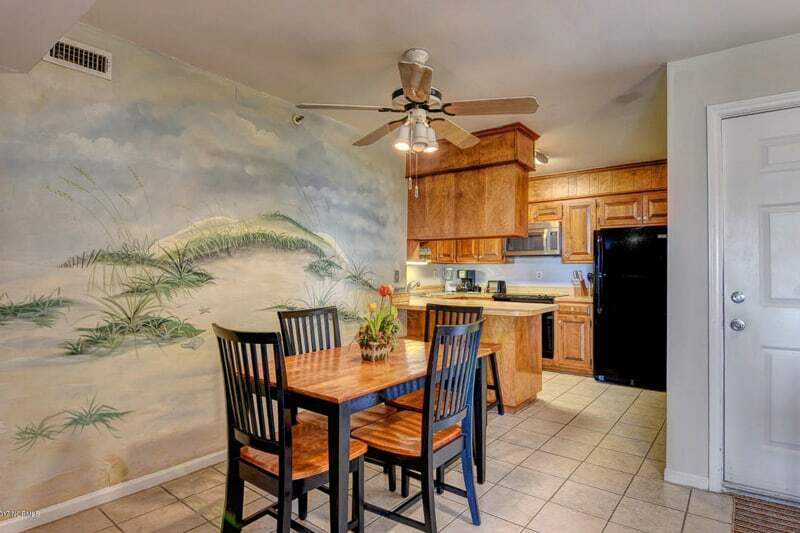 What fun to decorate a beach condo. Love what you have done so far. So far so good! I will be interested to see your progress! Thanks for sharin!g!! I have the same wicker chairs at my table I love them! I think the scale is perfect, Suzy and love the rustic charm! Love the wicker chairs with the table too – perfect for a beach home. Looks like you’ve got great plans for this space and can’t wait to see the reveal. WOW, what a splendid transformation! Love the lighting selection and white cabinetry. I agree with considering removal of cabinet above counter to open up the space into the kitchen area. Wow, you’re moving right along! By the time I get there to help, you’ll be done!! Love the light, great choice! I love a good before and after! That chandelier is stunning. What a statement piece! I would call this a modern farmhouse look, looks great! Love the light fixture! The condo is looking great! I never tire of your post …always an inspiration. I love the new chandelier. I am looking forward to seeing more of the new condo. Love the chandelier over your table. I need new lighting in several areas, so winning would be wonderful! Thanks, Suzy, for the opportunity! Great choice! Perfect mix of farmhouse and beach house. I love the light you chose for that space! It all looks so inviting! The whole room is so inviting & beautiful….. I entered. The light fixtures are beautiful. Thank you. 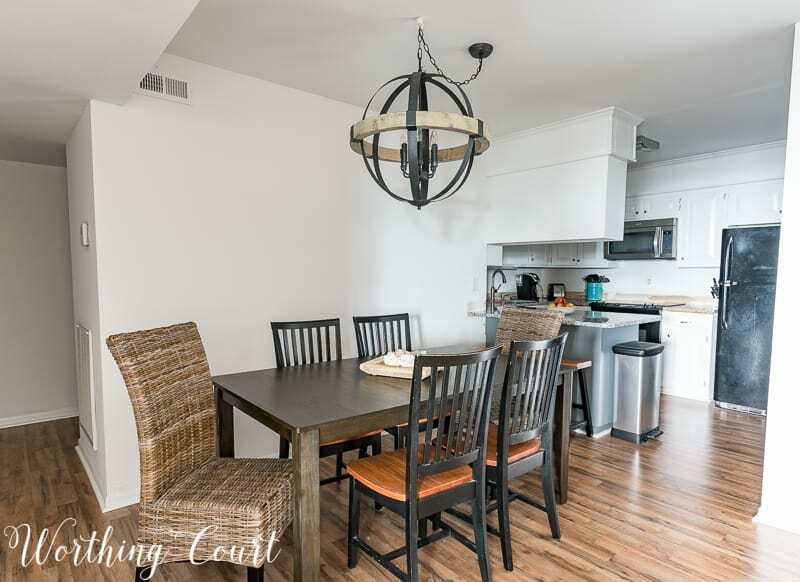 The changes in your beach condo are amazing…can’t wait to see more! I have always loved chandeliers but my house is small and I wouldn’t know which style to get. Chandeliers are so pretty and elegant looking though. Much better than a plain old light fixture or ceiling fan. Very cute! Looking forward to the finished product!